My Prized Possesions--A collector's guide! So here I'm again, writing about my world. While thinking about what to write I just saw a box(full of coins) here lying on my table and now I'm writing (and hopefully suggesting you guys) about my collections. As a kid I used to collect every silly thing that I came across. Then while growing up, I read it somewhere that when we collect anything, it has got a deep connection with our unconscious mind. When we look at the things we collected, we just go back to the time and its a way of escape from our present day ramblings, that depress us all. So, here is a list of things that I have collected over the years. I have been collecting them since a very long time. I never knew why one collects them or that the hobby has got a name. Neither I wanted to be a pioneer in the neighborhood's Philatelic society(that's what they call it I guess), I collected them because my mom once told me that his brother,i.e., my uncle used to collect them and she loved looking at it. So my adventure began. I collected stamps from everyone, everywhere. Then came the question of how should I keep them, I thought the the traditional way of maintaining an album was just not for me, so I asked my uncle and he told me to paste them on A4 sized sheets, one for each country. Li'l did I know that he was just pulling the leg of this nine year old. I pasted them and then realized I have actually ruined them, big time! Anyway, I still have them like that, pasted and love to see them. Each stamp in my collection has a different story. I'm a proud owner of stamps from almost all nations in the world. The most loved is the one which belongs to England, year 1993 and has the cartoon depiction of the Christmas carol. 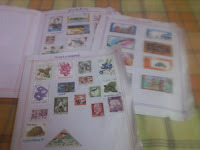 Yeah, I have got all most all the stamps of India, all the series, and I love them. I love reading, and have got loads of books. From Harry Potters to all the Dan Browns, from the originals By Saki to the originals by O.Henry, I have got them all. More inclined towards the fictions though, I have got some autobiographies(You see they help to write you well when it comes to write about "your goals", "your role model" and things like that for interviews and all.) I have got this one book by P.G. Wodehouse, which I bought ages ago and have never been able to read it. Again, the same uncle of mine suggested me that book, and all I achieved till date is 8 pages of the boring thing. I really have a grudge against this uncle of mine! And yes, all the Secret Sevens and Famous Five that encouraged and my friends to form our own secret group--the good for nothing group. Proudly, I say, I have got the currency and coins of 74 nations. 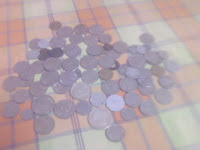 This a result of my "authoritative" announcement when I was 8--"I have started a coin collection and want coins for it ". Therefore, whenever anyone went anywhere, I got the coins. And I have got loads of Indian coins, old and new, from the British empire till the present day, collected by going to everyone's grand-parents I know. The oldest coin dates back to the 17th century. Though I know you get to buy these coins from Connaught Place but it is a altogether a different feeling when you toil for them. And yes my Di's boyfriend-turned-husband helped a lot with my collection. They are the mementos of anywhere I go, I just buy the unique key-ring that I can find. I have got hundreds of them, my favourite the one that someone got me from New Zealand. 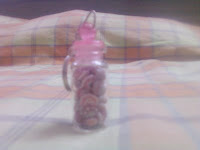 It is a beautiful li'l pink jar with loads of pink shells in it, rare one. One thing that I still continue to collect. I have erasers of all shapes, sizes and colour. I have got almost everything made up of this useful polymer. I collected them as I was a kid and now I collect them from my kid cousins. I have got a li'l cousin of mine who once came to my house for her summer vacations,and came across this collection of mine and later when she went back. Few days later when my dad went to drop her at her place she sent around 20 different erasers with him and later that day called up and said "probably their beauty will be lost if I use them". Cute. My mum hates it because I keep my collection in the refrigerator, you see Dilli ki garmi makes them all sticky and she feels that these boxes take up a lot of space in there! From our own Chacha Chaudhary to the young journo Tintin, they were a part of my growing up process. Loved reading them all- Billu, Pinki,tinkle etc. And Calvin and Hobbes, the only person whose philosophy works for me. I just flip through their pages when I'm free-reminds me of the good old days. One bookshelf full of them and I wish this grows every year. Every book reminds me of some good or bad times, like this Champak which my sister got me when I was in the hospital to read me stories to put me to sleep or the Laurel and Hardy which she bought because I tore my Didi's some other comic,or the fight that I had with my cousin over the Tintin. Most of the comics, or rather all of them belongs to my sister but they mean a lot to me. Well these are the six most beautiful collection of mine. I love them and they are my real prized possessions. P.S.1)My mum is eagerly waiting for me to go to the hostel or something so that she can get rid of my possessions. So please pour in with some nice emotional blackmails! 2)My Di, who is in Punjab at present to meet her extended in law's family called me today telling me that she saw some beautiful eraser and unique keyrings. So she has bought them for me. Bless her. 3)An all girls thing- I have got a huge collection of hair clips to match with all the dresses I have. Sometimes I buy dresses to match with hair clips. 4)As a kid I used to collect different stickers and I still treasure them. 5)Few years back there was this craze among all the kids to collect tazo(Something that used to come in the potato chips bag). I have got hundreds of them!Some of them even glow in the dark. 6)Bus tickets--I collected them too - from many Indian states. 7)The collector's guide says - try collecting all these. they are fun. Disclaimer: The photographs show only a part of the collections. Pictures taken by an amateur photographer. Please forgive the bad lighting! Yikes..is there something u havent collected...??? 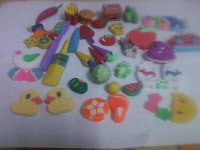 love the erasers...awesome collection u hv it seems 4m the looks of it!!! Thank you thank you everyone!! sometime a small little collection ropes in cute memories attached to it and you must have felt happy na? Live from the polling booth!